Last major update issued on June 13, 2004 at 03:35 UTC. The geomagnetic field was quiet to unsettled on June 12. Solar wind speed ranged between 297 and 393 km/sec. Solar flux measured at 20h UTC on 2.8 GHz was 88.0. The planetary A index was 7 (STAR Ap - based on the mean of three hour interval ap indices: 7.9). Three hour interval K indices: 12313222 (planetary), 22322211 (Boulder). At midnight there were 4 spotted regions on the visible disk. The solar flare activity level was low. A total of 2 C class events was recorded during the day. Region 10631 decayed slowly and quietly. Region 10632 was unchanged and quiet. [S416] This region emerged in the southeast quadrant on June 12. Location at midnight: S05E50. [S417] A fairly active region rotated partly into view at the northeast limb on June 12. This region is likely to produce C flares and maybe even minor M class flares. Location at midnight: N12E82. Flares: C1.9 at 18:41 and C1.1 at 19:43 UTC. 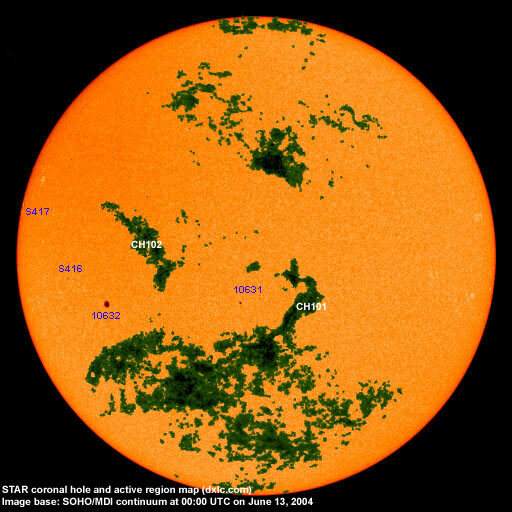 June 10-12: No fully or partly Earth directed CMEs observed. A recurrent coronal hole (CH101) in the southern hemisphere was in a geoeffective position on June 12. 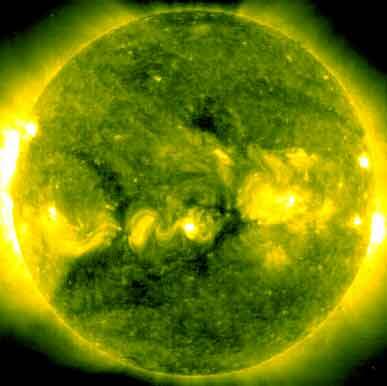 A recurrent trans equatorial coronal hole (CH102) will likely rotate into a geoeffective position on June 15. Processed SOHO/EIT 284 image at 01:05 UTC on June 12. The darkest areas on the solar disk are likely coronal holes. 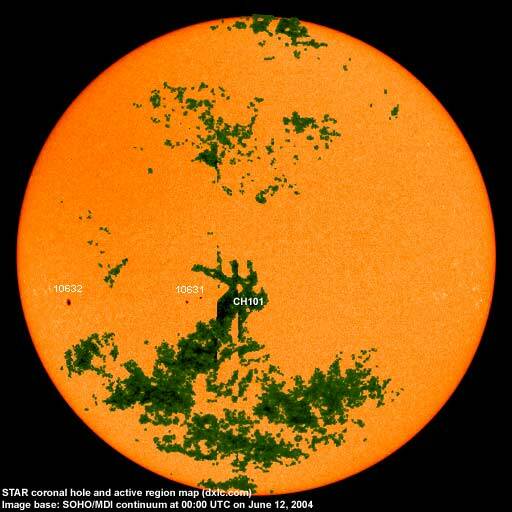 The geomagnetic field is expected to be quiet to unsettled on June 13-14 becoming unsettled to active late on June 14 and on June 15 due to a high speed stream from coronal hole CH101. Long distance low and medium frequency (below 2 MHz) propagation along east-west paths over high and upper middle latitudes is poor. Propagation along long distance north-south paths is fair. Trans Atlantic propagation conditions are monitored every night on 1470 kHz. Dominant station tonight: Radio Vibración (Venezuela). At times Radio Cristal de Uruguay was noted as well. On other frequencies propagation favored stations from Venezuela and the most common stations from Brazil. A few stations from North America could be heard with 590 VOCM and 1510 WWZN having the best signals.